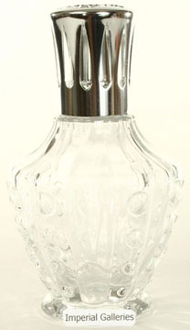 The beautiful Lampe Berger Clochette lamp in clear highly figured glass offers a true bargain! Highly recommended by Imperial Galleries. The lamp is supplied in a gift box with burner, funnel, and instructions. Height: 6.5"